Grease an 8 or 9-inch round cake pan. With an electric mixer on high, beat sugar, eggs, & vanilla for one minute to thicken. On low speed add remaining ingredients (in the order listed) but do not over-mix. This should take less than a minute. Pour into pan and bake for 25-30 minutes until a toothpick inserted in the center comes out clean. I like to frost it with my 2-minute chocolate frosting. Note: Based on some comments, if the cake seems bland feel free to add a little salt, although I prefer it the original way. A cake strip will keep the edges from over baking and will keep the cake from being domed or rounded in the center. For info on cake strips click here. For more on this recipe in my blog click here. 212 Comments on "Easy One Bowl Yellow Cake"
Your recipe doesn’t state to use buttermilk but I read a note you added and it said you did. So should I use buttermilk or sweet milk? Please direct me to the note as I can not find it. I’ve looked and looked for a simple, delicious cake like this to make for my husband. Great cake!!! Thank you for publishing it. It is a moist, easy cake to make. I’ve looked and looked for a simple, delicious cake like this to make for my husband. Thank you for publishing it. It is a moist, easy cake to make. Hi Jenny, I made this recipe today for a gathering. It came out delicious and moist. Also made your 2 minute frosting. I used the Hershey special dark cocoa. This was very creamy and rich. Lots of compliments..BTW, I make many of your recipes from 2 hour crusty bread, which everyone loves, to the Cinnamon raison swirl bread.AWESOME..I think I will make the braid next time..I have also made your pita bread. Delicious..Love your site. I love cooking and baking, especially trying new recipes. I have been making English Muffin Bread, which is incredibly easy and delicious. Let me know if you would like this recipe. Believe me. I make this alot forfriends and family. They cannot get enough of it. I think you would agree. The cake came out amazing!!!! but since I have a gas stove and oven I lowered the heat to 300 and it cooked perfectly for 20 minutes but I did preheat for 350 and I used a 9 inch pan. I doubled the recipe as I like making Layer cakes. Also added a tsp salt to the recipe. Made 24 cupcakes that baked perfectly at 14 minutes. Tastes like a cake mix. All in all not a fail…I’ll take it. I am going to try using this cake as a base for a pineapple upside down cake! I made this recipe today. It was good and fluffy and very easy to make. the only issue was it tasted floury, like it was nor cook well. When I inserted the clean knife, it came out clean at 35 min. The only thing I changed was that I used self rising flour instead all purpose flour as you indicates in recipe. What do you think? other than that it would have been super. Every day I searching your website. I suggest trying it with all purpose flour and see if it’s better. Really good cake. Easy. Don’t over mix the batter! Do add more vanilla and/or almond extract. I bake it in a loaf pan (45 minutes, 350) and pour ganache over it or split in half and fill with fruit and cream for our free community lunch. If you are an over mixer, over mix your liquids and fold in the dry with spatula. Very good, very simple cake. Fast, easy, and doesn’t require uncommon ingredients (I never have cake flour, for instance, so cake is often hard to make). Anyone whose cake comes out dry has likely over-mixed the batter. I found it perfectly moist. I don’t love the recommended chocolate frosting recipe (it’s too bland and gritty), but there are plenty of other options in that regard. Great cake recipe I’m adding to my collection! Wonderful cake…I did beat eggs for three minutes…and added one tablespoon instant vanilla pudding mix to boost flavor and a tad more sugar….kept everything the same…….it was a moist sponge type cake……a keeper…..thank you for sharing…..
Hi Jenny I’m new fan . My kids and I love this recipe along with your chocolate cake recipe. Its was so simple thank you for sharing. This little layer makes a great pineapple upside down cake. Delicious. Delicious, easy cake! I used it for strawberry shortcake. Next time I will add a teaspoon of butter flavoring. Hi Jenny, l’m a new fan of you. I Love your recipes it make me feel like a real chef.😄 Can l use this cake for a tres leches cake?.. I made the apple pie and it was delicious. Now l checking all of your recipes. Thank you, Thank you, thank you. I made it gluten free. Not sure if oven or gf flour caused it, but cake did not brown on top. I used wax paper and cooked 30 min. I did use reduced sugar suggestion and topped with cherry pie filling. It is good. I forgot to mention that I also used cashew milk. I can’t believe how easy and how mine turned out just like the picture. I topped mine with a peanutbutter icing . I have made this cake two times absolutely delicious. I am wondering if I could make the batter and put on top of a prepared strawberry rhubarb mixture in tbe bottom of the pan.? This receipe was easy to make and delicious. We used 2/3 cups of sugar and topped with strawberries and blueberries. Everyone went back for more! I just made this one bowl yellow cake last night and I was so excited! It is just the right size for a few people and I like not always having a 2 layer cake to have to eat up. This was perfect. Such a great texture and perfect flavor to dress up or eat just as it is. I did have some left over pineapple rings and maraschino cherries in the fridge and immediately thought of Pineapple Upside down cake. So this time I used 1/4 C of almond milk – we are dairy free here – mixed with 1/4 C of pineapple juice and that was the only tweak to the cake because I wanted pineapple flavor in the cake. No butter melted in the pan first. I lined it with parchment paper and just popped in 1/3 C of light brown sugar and spread it out and laid the pineapple rings and a cherry in the middle of each one on top of the sugar then poured that lovely batter on top. I baked the cake at 350 for 30 minutes and it was golden brown and baked to perfection. I inverted the cake on a plate, removed the parchment, and let it cool about 20 minutes. We cut into it and it was perfection. Thanks for the yummy recipes and the entertaining and easy to follow videos. You are such fun to watch! I have tried several of your recipes and I haven’t ever been disappointed. I mixed it all by hand and used self rising flour and omitted baking powder. I also used butter and nut extract like my Grandmother did in her yellow cakes. I also used FF milk. Just used what I had on hand and it turned out great. I will use this as my go to snack cake since I just eat mine plain. Thank you so much. See my Quick & Easy Chocolate Cake. Excellent quick cake recipe. I’ve made this recipe three times using an 8-inch square pan lined with parchment on the bottom. It’s very easy to hand-mix the batter because the recipe uses oil not butter, no need to use a mixer. I made a lemon cake by substituting lemon extract instead of the vanilla extract and topped the cake with a light glaze of confectioners sugar mixed with fresh lemon juice. Really great summer cake served with vanilla ice cream and slices of fresh fruit. Wow, a food blog that gets right to the recipe without the unnecessary novel preceding it like on every other ad-riddled blog. Well, looks like I’ll be trying your recipe! Lol on the novel…. yup, i agree….how pleasant to JUST get the recipe!! Do you think I could replace the sugar with raw honey? If so would I need to alter any of the other ingredients??? I’ve made this cake 5 times and all but 2 came out great. I tried to double the recipe and my guess is that i didn’t add enough of something like baking powder or flour. It came out horrible, it wasn’t cooked and it was clean when i stuck the tooth pick in but when i ate a piece it tasted like egg and flour. The other 3 times it came out great. It wasn’t to sugary or bland it was just the perfect amount of sugar for my sisters. This cake is perfect! The ease of prep and delicious end result have definitely crossed boxed mixes off my shopping list! I made it with the reduced recommended 2/3 cup sugar, and it was sufficiently sweet. Thank you for posting this “keeper” recipe!! my cake turned out LITERALLY like cornbread… dry and dense also. anyone else? If you can send me an exact list of each ingredient you used (be specific) including the size of the pan, and your method of mixing & how long you preheated the oven, I will try to help figure it out. Perfect for the use of creating a cake for Strawberry Shortcake. It sliced easily through the middle to create a pocket for the fresh, crushed strawberries & powered sugar. I baked it in an 8 inch square pan. However, I wouldn’t bake this as a traditional cake with icing. While it was perfect for my purposes, the texture was too dense to be considered a regular cake. Definitely easy to make and I like that it’s just for one pan! However for us, it came out a bit dense, dry, and bland. I used less sugar — next time I think I would use the higher amount. Maybe I didn’t beat the eggs “thick” enough? Using this cake recipe to make a peach dump cake tonight. Excited – will let you know how it turns out. Thank you. How did the peach dump cake turn out? I just made Jenny’s original yellow cake recipe with the chocolate frosting. It turned out great! I passed Jenny’s site along to my daughter and friends. The other week I made her chocolate cake recipe with no eggs. Oh my, it was so moist, tasty and everyone thought it was delicious. Made this cake twice so far. Used butter both times instead of olive oil. First time it seemed like it didn’t rise very much. Wife also said it was pretty dry. Could have fooled me. She ate 2 pieces, as did my son and we had it two-thirds done before too long. Then I noticed both my baking powder containers said they were expired – one expired in 2012! Who’da thunk baking powder expires? So the second cake, without question, was much better. Look on Internet how to test yeast, baking soda, baking powder for baking. I have used all well outside of expiration dates , IF they still test active. I made this cake today. Did not add salt and used the lesser amount of sugar. I split my piece in two and spread it with black raspberry “Simply Fruit” in place of frosting. Enjoyed it a lot and want to thank you for all of your healthier recipes. What if u don’t havebaking power!!!? WHAT if u don’t have baking power!!!? They’re many substitutes for baking powder. One of my favorite substitutes is a mix of 1/2 teaspoon of baking soda and 1/2 cup of plain or vanilla yogurt. I forgot to mention that the whole half a cup of yogurt and 1/2 teaspoon of baking soda makes up for the 1 1/4 teaspoon of baking powder. It sounds like a lot, but it really works. You can use almond extract or another extract because the vanilla is for flavor. Hope this helps!! There is NO-THING more to say!! Yo! This recipe is dope. I’m very pointedly ignoring my adult responsibilities and I wanted to make some yellow cake bc I made a yellow mug cake the other night and loved it — and google showed me to this page and DANG. This is a good recipe. I did add some salt (mostly bc I bought myself a $5 thing of pink himalayan salt, not that I’ve noticed a huge difference vs other salt) and I went with slightly less than 2/3 cup of sugar, and it still tastes amazing. I also made them into cupcakes bc I don’t have a cake tin. They puffed up so much! hi jen, have been trying your recipes and so far everyone of them are so delicious and easy. my friend is a polish girl and is enjoying this site also. thanks again. Would it work to double recipe and put in 9 x13 inch pan? What if I can’t use milk?? I also have a milk problem and was hoping for an answer for a substitute for the milk. I used lactose free milk and the cake turned out great as my daughter is lactose intolerant and does not like the almond or soy. Is this cake sodium free? Essentially, it is sodium free although milk and eggs do contain small amounts of sodium (about 200 mg in this recipe). It’s not much for an entire cake, about 25 mg. of sodium per serving. Of course you would not add any salt as some people have done per my bottom note. Did you use the pudding in place of an ingredient? Nice cake in a pinch. Followed this recipe, but used whole milk. Used it to make caramel poke cake and it turned out well. Definitely will make this again! Why does the chocolate cake uses baking soda and the vanilla use baking powder? I just looked at the chocolate cake recipe, it doesn’t use egg, and uses either lemon juice or vinegar which when combined with the baking soda does the same thing as baking powder. Thanks for this wonderful recipe! I baked this cake yesterday for my niece’s birthday. Everybody loved it.It was a huge hit. Such an easy, yummy cake! I’ve made it probably a dozen times. I vary the frosting between fudge, lemon, and peanut butter, or whatever sounds good on a given day…and it’s always delicious. Thanks, Jenny, love your recipes. 1 minute is not long enough to beat the eggs and sugar for this type of cake. I used to make this all the time when I lived in England and the key to success is to beat until you can leave trails in the mix if that makes sense. At least 3 anyway. You need to build air into this mixture otherwise your cake will be flat. My cake turned out perfect so otherwise this is an excellent recipe. Oh and I did add salt. I just made this cake. I added cinnamon and pinch of salt. It is delicious! I made a vanilla glaze to go over it. YUM!!! Tastes like a coffee cake! How me CH cinnamin did u used? This is my second recipe trying from this website – the first being the no butter chocolate chip cookies which are a must try! This recipe was very easy to make. I did have only extra virgin olive oil on hand and I was worried about the taste making my cupcakes taste bad but it’s very subtle once it’s baked. I do have to agree with others that the flavor of these cakes is bland but for a simple breakfast it’ll go great with some tea. I’m going to put icing on my cupcakes since I’m making them for my boyfriends coworkers. This recipe is very adaptable so next time I will use it as a guide line and add a pinch of salt. Will make again. Loved the simplicity and taste of this moist and tasty cake. Recognizing that the point of this site is no-salt/no-butter recipes, I nevertheless added salt (1/2 tsp kosher salt) and used melted butter. I do think that for people who found the taste flat, probably the relevant factor was the lack of salt in the recipe as given. However, I can imagine it would still taste good with no salt, if that is desired for someone’s specific diet. The reason I sought out this recipe, even though I love salt and butter in my recipes, is because I wanted a one-layer cake recipe (rather than halving a standard 2-layer recipe, which usually seems to call for 3 eggs, and I wasn’t sure whether it would be better to go with one egg or two when halving the recipe). Also, I needed a recipe that I could whip up by hand since I’m in someone else’s home who has no electric beater, so an oil-based recipe worked well. But what really astonished me was the sheer EASE of making this cake! After I’d made the first layer, I decided I really did need two layers after for various reasons. With a more typical recipe, I would have dreaded the prospect – but it was SO quick and simple that I just did it, lickety-split! Thank you so much for this tasty, quick and easy cake recipe! Forgot to mention – FYI: I used full-fat buttermilk in place of low-fat milk. This cake was moist fluffy and delucious! Not to mention Easy!! I used the recipe as base and used cashew chocolate milk instead of normal milk and coconut oil instead of olive oil. It tastes great and I was out of baking soda😂 still came out as cake. Thanks for the easy recipe! This looks like a great recipe, thank you for sharing. I would like to know how I would be able to adapt this recipe to bake in a 13*9*2 inch rectangular baking dish? Would I need to double this recipe? Typically, recipes say the amount of batter for two layers = the amount of batter for a 9″x13″ pan. So yes, you would double the recipe. I made this cake today and doubled the recipe. It fit perfectly into a 9×13 pan. I did not use light olive oil because I had only the regular kind. I used vegetable oil instead. I love things sweet so I added 1/2 cup more of sugar, and it was fine. What I did do was add 2 tsp ( remember I doubled everything) of MAPLE extract. That makes everything pop. I used a cooked icing that I have had the recipe for, , for almost 40 years. It is a great icing. I added 1 tsp. Of maple extract to that, too, which turned a brown sugar type caramel icing into a maple icing and I added walnuts on the top. The cake was ok ( cooking time was 30 minutes.) I forgot to add salt which would have made it better. Right now I have it covered and in the fridge which keeps it moist. This was wonderful. I used buttermilk instead of milk and topped with a strawberry buttercream. Exactly what I was looking for. I absolutely thought it was a lovely website until my cupcakes turned out horribly! This is not a cupcake recipe. Sounds like user error… I have tried this and many of her recipes and they always come out perfect even when I’m feeling lazy and eye ball the ingredients. You must add salt to this cake – 1/2 teaspoon. Leaving it out will cause the cake to peak in the center and taste flat. This cake is very quick and easy to make, however, it doesn’t have much flavor. I guess it would be better iced, but I don’t make iced cakes because of the calories. So…I think I’ll add the zest of an orange and just dust with icing sugar. Hopefully that will help pump up the flavor a bit. As the owner of a Gluten Free baking company I can say this is the easiest, least technical, consistent recipe for a great tasting base for any flavor or style cake. AND it is xtremely easy to make gluten free. Great job. I substituted Bailey’s Irish Cream in place of the milk and added 1/4 tsp salt. I topped it with a glaze made with 1 jar marshmallow cream, 1.5 cups powdered sugar and 3Tbsp Bailey’s. Yummy! I made this and I used wesson oil. It wasn’t as sweet as I would have liked it but my brother loved it. Can I add 1/4 more sugar with the same amount of ingredients or do I need to increase all ingredients especially the flour? Very easy cake I did not use a mixer came out great. Thank you for sharing. I was wondering if I could make it successfully without a mixer – thanks, very helpful to know! I serve this with strawberries and lightly sweetened whipped cream. Add a grating of orange zest – it really lifts the flavor of a simple dessert. Can we reduce the measures by half and try the same recipe ? You would also need a pan that’s about half the size. Thank you so much , I made this cake my husband loved it. Finally , I found a cook trying to convert everything to healthy. I also made cream puff with oil . Try it it is great. Please keep trying recipes for deserts . This is a great basic recipe. I used as a guide to make a gluten free cake that came out great. (Maybe don’t do that unless you understand gluten free baking). I used melted and browned butter in place of the oil and brown sugar for some added flavor. So no I did not make this cake, but the simple method makes it a great recipe to tweak if that is what you are looking for. Just a tip…I added an eighth teaspoon molasses to brown sugar, and it made the cake just a tad more moist. I’ve made this cake twice now, and have a comment and two suggestions. The crumb is good, it is moist, and it really couldn’t be easier to put together. Unfortunately, as baked from the recipe, it is flat in taste. Just doesn’t have the delicious flavor that freshly baked “scratch” cake should have. The oil flavor was quite noticeable. The second time I doubled the recipe for a birthday cake and added salt. 1 tsp for the doubled recipe. And I used a neutral flavor oil, canola, so the oil flavor wasn’t as strong. So much better and tastier. Thank you for the super easy yellow cake recipe. Nice I will try thx for the tip! Salt was going to be my suggestion. I was looking for a cake to use for fresh fruit upside down cake and this worked great. Love the substantial texture. If you use extra light olive oil, there will be no discernible taste. Does this cake rely on the electric beater and egg aeration to rise, or do you think it would work with thorough hand-mixing and have enough baking powder to rise? I forgot to add in my post that I added 1/2 tsp. of salt to the recipe. I think salt brings out the flavor of the cake. Fabulous, quick cake! I needed a recipe for a small cake and wanted one that used oil, not butter. This recipe took no time at all to put together and is my new go-to yellow cake. I frosted it in the pan with fresh lemon buttercream (I had to use butter somewhere :?) and it’s amazing. I’m serving it to my company this weekend, and I’m confident they’ll love it too. This is an awesome recipe. I did add approximately 1/2 teaspoon of fine grain sea salt, and I also put a generous amount of simple syrup on the cake right after I removed it from the pan. I will be making this again and again, as it couldn’t be easier, and oil-based cakes are always very moist (this being so exception). Delicious cake! This will be my go to vanilla cake from now on. I’ve made it twice in the last month for different occasions and it has turned out great. I use whole milk and it seems just fine. Thank you! This cake was amazing! Very easy to make and it tastes good too. I only had EVOO and worried it would over power the flavors, but it didn’t. Thanks for sharing! I also used a glass pan and cooked perfectly. What adjustments in temp and or time if I used a glass load pan instead of a round or square pan? Thank you. Just made a triple batch to use for a birthday cake. I used the baking non stick spray and baked in 2 3″ deep 8″ round pans. They came right out while still hot and are a great texture for cutting into thinner layers. Great, easy, no fuss recipe. Thanks! 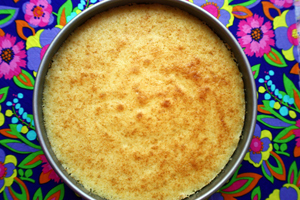 I was searching for a quick 1 bowl yellow cake recipe to make a one layer cake to use up a little over a cup of Tres Leche milk without having to go to the trouble of making a 3 bowl, 5 egg sponge cake. This recipe worked. Do flour or put parchment paper in the bottom. The cake had a hunk come out of the bottom, but I was rushing the cooling in the pan process. I made a simple chocolate ganache that covered the area. I recommend cooling completely before eating but our thoughts turned to food during a winter ice storm and we didn’t want to wait. Cake was better the next day. I added 1/4 teaspoon salt, will add 1/2 teaspoon next time. Food needs some salt, improves the flavor. I also added 3 drops of real almond extract, usually reserved for my white cakes. Was a nice touch. Hi, Jenny. I’m fairly new to baking and was just noticing that the recipe says to grease the pan but doesn’t say to flour it. What is this anarchy? Does that really work??? My family loved the cake and it was super easy – just what i need. Thanks for another winner! How did this cake taste i wanna make it for my family dinner but i want to make sure it tasts good!!! Looking through the comments should be helpful. Hi Jenny can I use self-rising flour and whole milk and vegetable oil or canola oil in this recipe this recipe is very easily and I thank you for. Self-rising flour already has a rising agent so you would have to make adjustments. I have never used whole milk so you may have to try, and vegetable or canola oil are fine. I have never used self-rising flour but you might be able to find something online on this substitution. Hi jenny .. does this cake freeze well 😃 thanx …. I have never frozen it so I can’t say. Hi Jenny. I just made your yellow cake recipe and made 12 cupcakes for my granddaughter. I filled cupcake pan 3/4 full and baked 15-20 minutes. It came out really good! I really enjoy your videos and have made so many of your recipes. Thank You so much. Would I be able to substitute the 1 1/4 cups of all purpose flour for 1 1/4 cups of whole wheat pastry flour in this cake? As well as doing the same thing in making your chocolate cake? Thank-you for your time and effort in doing this site – love it!!!!! You could try but I think you will find the cakes quite heavy and dense. When using glass for baking, you are supposed to reduce the temperature by 25 degrees. At 350 it actually should have over-baked so did you change the recipe in any other way? If it’s actually completely raw, I can’t understand except that your oven temperature was much too low or you drastically changed the recipe. I just made it in a 9×9 square glass pan, no parchment paper or anything, just oil and some flour, maybe it didn’t even need that but anyway, at 30 mins it was completely done, and I forgot to turn down the oven by 25 degrees and it still turned out nice, I wish it was a bit more moist, that could have been the oven tempt. but with a filling it’s very nice when you don’t have butter. I love baking with butter and am so glad that the myth about butter being bad for you has finally been debunked as butter in its natural form has so many wonderful nutrients. I always get organic ingredients and make dessert a nice occasion, so all in modernity and no worries about fat because really, sugar and plain oil are the bad ingredients here if we’re to examine more accurately. Hi jenny… The cake had a beautiful texture… Beyond expectations for such a simple recipe.. I was wondering if 1/4 cup of the flour could be replaced with cocoa powder.. Will it turn out to be a chocolate cake? I have never done this but it seems to me it could work. If I tried it, I would also add 1/2 teaspoon baking soda and 1/4 teaspoon of salt. Let me know if you try and we can share your results. Does this recipe not require salt? I don’t use salt in this recipe but I suppose you can if you like. I just found your website a couple weeks ago. I have made your 90 min. whole wheat bread. I have personalized it slightly. I add rounded tablespoons of wheat germ, hemp grits and quinoa. Also a tablespoon of Bob’s Red Mill vital wheat gluten. It’s absolutely fantastic with or without the changes. Today I had some blueberries that needed to be used. I made your Easy One Bowl Yellow Cake to go on top. I used a square glass pan to pre cook the blueberries with a bit of sugar and corn starch in the microwave. I t couldn’t have turned out better. Delicious flavor, lovely texture. Thank You so much. That sounds interesting, did you just put the blueberries, some sugar and cornstarch in the microwave for a short time and when you took it out you put the prepared batter on top of it and baked it all together like that? My 2.5 year old son loves the kitchen, recently he’s been asking/demanding “make cake!” This is the perfect recipe, we do it all by hand and sometimes throw some chocolate chips in. Just wanted to say thanks for the great simple recipe! We’ll be making it again today! It’s really easy to make this cake following exactly your simple and yet detailed instructions. Your recipes with oil instead of butter, and less sugar encourage me to try them whenever possible. Thank you Jenny. I don’t have vanilla is there anything I can replace vanilla? I don’t think there is any substitute for vanilla in baking. I have only used vanilla so you may have to experiment. If I run out of vanilla I use 2/teaspoons pancake syrup, it is quite good! I have never doubled it so I don’t know. Hi Jenny 💕 Your recipes. Can I use self raising flour for this recipe? I just made this recipe but baked it as cupcakes. It gave me 18 medium cupcakes and the cooked it about 15-20 minutes (I have a very bad gaz oven tho, might take less time in a good one). They taste really good, not too sweet. They are the perfect canvas for a sweet icing or to be filled with lemon curd, salted caramel, you name it! I only have extra virgin olive oil….will it taste any different and will it be sweet or harsh tasting? It might taste and smell like olives. I don’t usually bake with regular olive oil, only extra-light or canola or Smart Balance oil. Does this this recipe work for cupcakes? If I pour the same batter into a cupcake tray. I have only made it as a cake but please see Tania’s comment above. Easy recipe but I’m totally sure about the consistency. Mine was a bit thick, I might have over mixed it. Please let me know how runny or thick it’s supposed to be. Simple, yet delicious! Thanks Jenny! Hi Jenny! after 1 year of trying to make no-knead bread (unsucessfully) i came upon your YT site. Your ingredients were not much, if any different. It was watching you do it (your method) that gave me the confidence to try one more time, and voila! it worked! the first try, my bread looked just like what i had been trying to get all that time! All your videos and instructions are helpful and easy and produce good results. Thank you for all you do! You are great. Every recipie is quite good.well done. Jenny, I LOVE the way you organized your site. I look at a lot of cooks on YOUTUBE and when you go to get their recipes, it is a complicated and sometimes impossible task. On your site the recipes are beautifully done to print out and use. Maybe you can moonlight as a designer for you tube cooks to help them set their sites up! Thanks!! Those complicated recipe websites are hard to navigate because they are full of ads & links because that’s how the sites make money. I don’t allow ads and I always decline offers to take money to promote products. I keep the site the way I would want it as a visitor – free for everyone and easy to navigate. I’m glad you’re enjoying it. Lovely textured and tasty cake and so easy to make. Thanks Jenny. Last time I made it I added sultanas and lemon juice and baked it in a loaf tin. Turned out really well and was not dry like some recipes for bar cakes are. I made this last night as hubby’s birthday cake today. It was so easy to make and very affordable. I added a cup of frozen stawberries and cooked it 10 minutes longer. Tasted like a moist strawberry short cake minus the whip cream. Awesome recipe ! Lightly sweet chocolate-orange marble cake made with extra light olive oil. Gets rave reviews every time. Instead of oil can I use salted butter or clarified butter? I love this recipe. Any ideas on a easy buttercream frosting? The cake turned out moist and delicious and so did the Chocolate Frosting. Thank you for sharing your recipes. Hi jenny, thank you very much for all your delicious recipes. I baked this yellow cake and it is very good, i like it alot. My question is after baking and have some leftover , how should i keep that fresh for a few days? Thanks again, you are so nice and a beautiful lady. The less air foods are exposed to the fresher they stay. I would cover it as tightly as you can with plastic wrap. If it’s frosted you can refrigerate it first and once the frosting is cold you can put plastic on it without sticking. After the second day, I usually keep my cake refrigerated. Hi Jenny, I was wondering if I can use Cake Flour instead of AP Flour for this recipe. Or maybe 1/2 cup AP Flour and 1/2 cup Cake Flour plus 1/4 cup AP Flour. Not sure if it will work. You can if you want to but for every cup of cake flour that replaces a cup of a/p flour, you need to add 2 tablespoons of additional cake flour. I can’t wait to try it. Thank you for the recipe. I bough 9″ cake pans and 13″x11″ made by “PEMA” many years ago and I neve have problem with baking. They are made with double layers to keep even baking….never to dry or burned on the edge or dormed on top of cakes. Price is reasonable. It is always fun to watch JCC, and recipes are great too. Thank you. I looked for the Pema pans to share a link here but I can not find them. Is there any other info on your pans or maybe they don’t make them any more… or maybe not in the U.S.? Hi Jenny, I love all your recipe’s, wouldn’t think of changing a thing. Thanks girl. Ok, it’s now 2017 any luck finding the PEMA pans Fran mentioned? For anyone on WW, just enter the recipe in the recipe builder either on their site or in the WW app and it will figure the Points vale. I would love for u to include the fat, carbs, fiber and protein content in your recipes I am on weight watchers, so I need to count the points on the program. I’m just sharing what I make at home and do not have that information but see Granmama’s post right above. I agree with the previous post from Glo … Your recipes are so easy to follow. This cake recipe is perfect to teach my grand kids, 10 and 7. They enjoy baking very much.